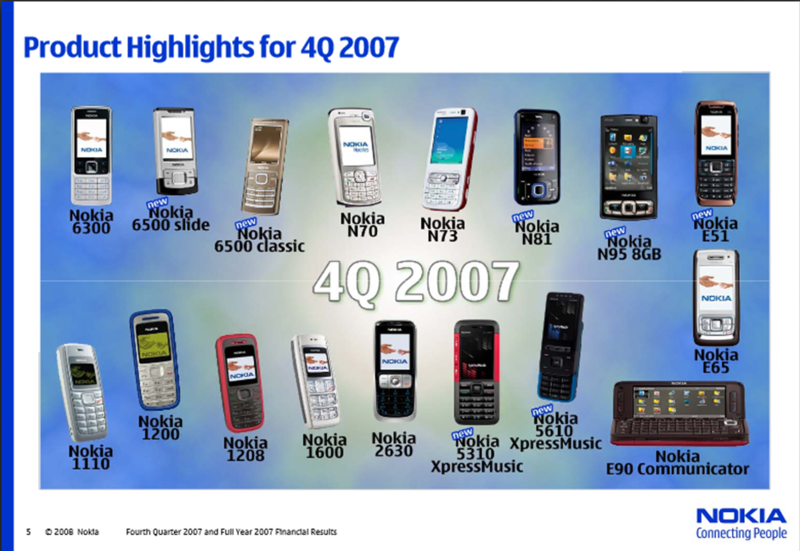 I collected som key statistics on the performance of Nokia during the period 2004-2012. While these figures need to be analyzed in further detail, a glimpse at them still gives a good idea of what has happened. 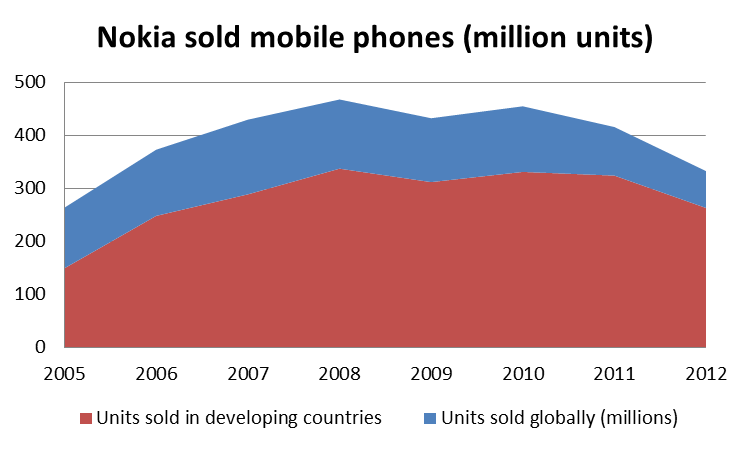 The first graph depicts Nokia’s sold volumes, both in emerging markets (China, Asia Pacific, Middle East, Africa and Latin America) and their total sold volume. It is worth noticing how large share of their volumes were actually sold in developing countries. Interestingly, the decline is much steeper in developed countries (Europe and the United States) where the company lost 47 percent of its volume from 2008 to 2012 as compared to 22 percent in emerging economies. Needless to say, the company’s market share has declined significantly. It peaked around 40 percent in 2007. 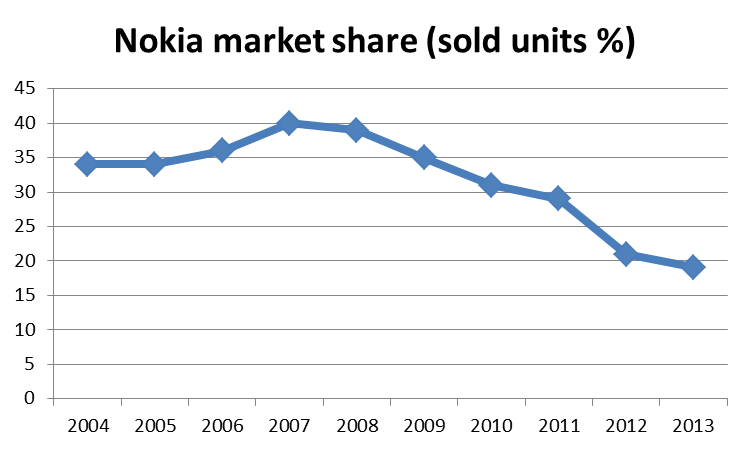 In the years up to the introduction of smartphones, Nokia gained market share on a growing market. 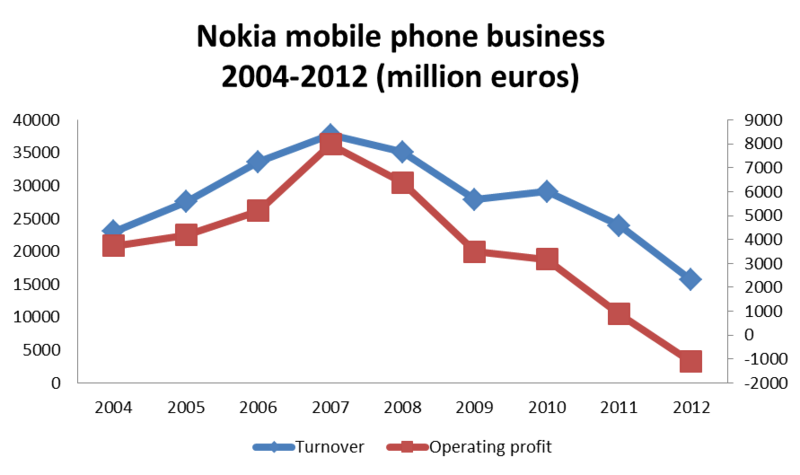 Another, perhaps more important explanation of Nokia’s problem is related to the decline in Average Selling Price. 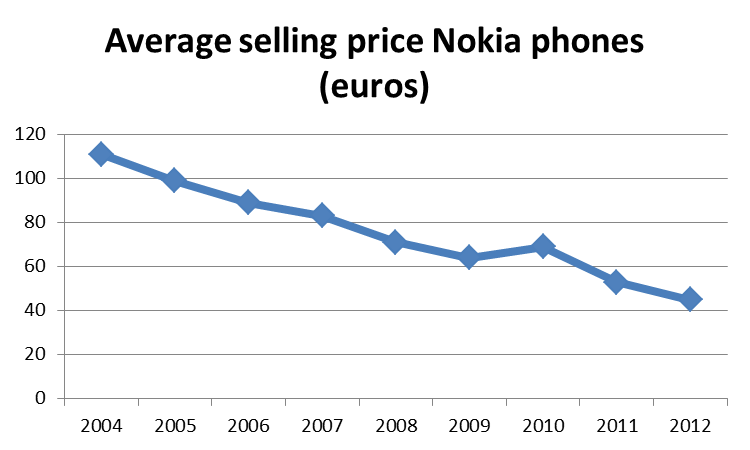 If each sold phone generated 110 euros of revenue in 2004, then getting only 45 euros per phone in 2012 is of course a tragedy for the company. For sure, parts of the decline in Average Selling Price can be explained by increasing volumes in developing countries, but it is nevertheless clear that price competition has been fierce in these years. Nokia has been squeezed from two ends – in emerging economies, cheaper, local manufacturers have eroded the company’s margins and in the Western world Nokia has been forced to cut prices due to an outdated product portfolio. It is truly amazing how a company can appear so solid and competitive and then fall apart within only a couple of years. Apple’s IPhone was first revealed in January 2007 and available for consumers in June the same year in the United States, then progressively launched globally in 2008. 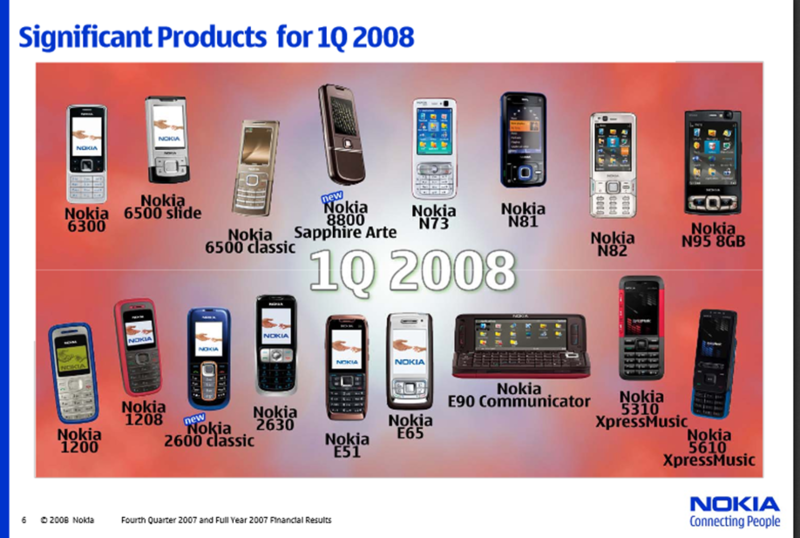 Out of curiosity I pondered through Nokia’s quarterly presentation slides in the years 2007-2010 in order to get a better idea about how they related to the ongoing shift from feature phones to smartphones. While such a brief and shallow review will not give the full picture of Nokia’s response, it might still reveal something. 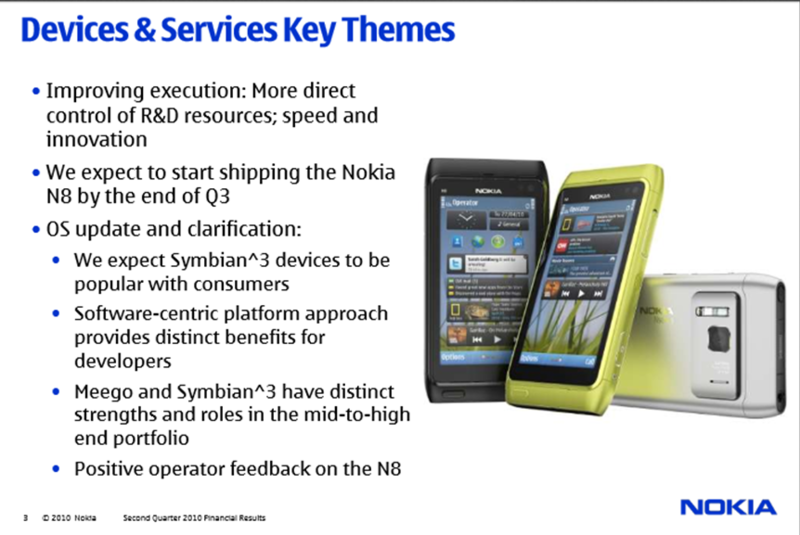 Going through these slides it is striking to what extent Nokia emphasizes the strength of its ever larger product portfolio. In the years 2007-2008, virtually every slidestack contains at least two full slides crammed with all new product launches. The images below come from some of these presentations. It is also noteworthy how little is said in these years concerning technological change and the emergence of smartphones. 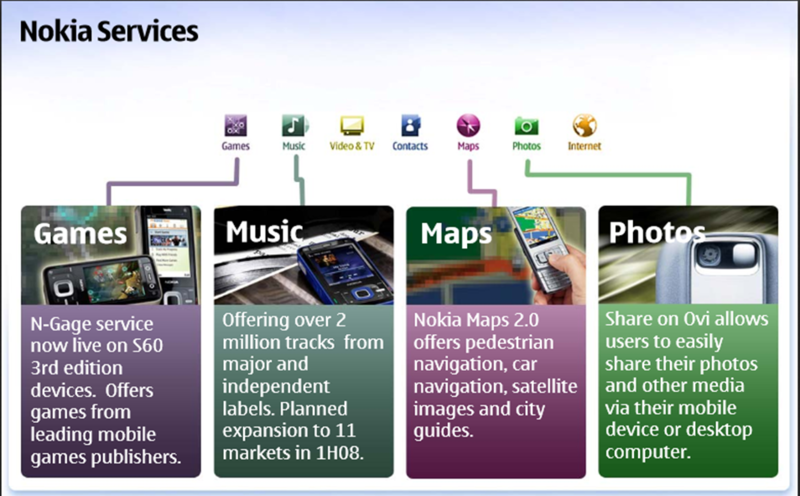 Most of the information is related to market growth, Nokia’s market share, gross margins etc. Towards the end of each presentation, a 2*2 matrix with threats and opportunities is presented. With no exceptions, this slide is very unspecific and the term ‘Competitive factors in general’ is frequently used. Here, there seems to be a symbiotic and destructive relationship between established firms and the stock market. Financial analysts care about the big numbers (revenues, market growth, market share), these notions fit neatly into their spreadsheets and number crunching exercises. Technological change cannot be easily quantified, nor fully assessed in terms of its organizational impact. Top management therefore happily focuses on the aforementioned issues and this inevitably makes them pay less attention to changes of a more discontinuous nature. Associate Professor Mary Benner at Minnesota University has shown that stock market analysts virtually ignored Kodak’s and Polaroid’s digital efforts in the 1990s, while they paid a lot of attention to (and praised) their product launches based on photochemical film (read more here). 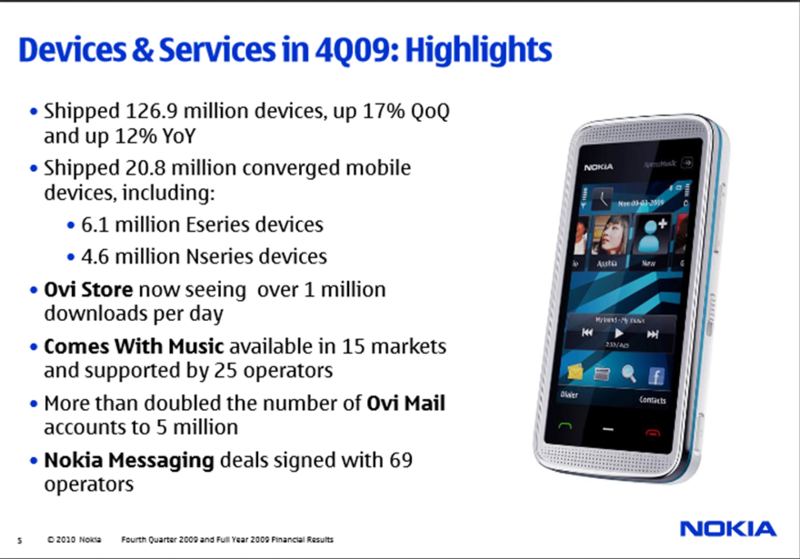 “Nokia continues to expect industry mobile device volumes in 2008 to grow approximately 10% from the approximately 1.14 billion units Nokia estimates for 2007.” (the presentation can be found here). Being present in a growing market can be highly deceptive because growing demand might obscure the fact that a technology is about to become obsolete, thus sending a false message to incumbent firms that things are actually going well. This was indeed the case with film sales for Kodak in the late 1990s and for analog CCTV companies in the 2000s. The market kept growing and an increasing demand concealed the fact that the technology was going to die, thus reducing the incumbent firm’s sense of urgency. At this point it seems that the company is recognizing that software is becoming more important and that phones are used for a wide range of different purposes. But the response is to do more of the same, i.e. launch more feature phones with different functionalities and hanging on to the by now outdated operating system Symbian. In Q1 2009, the company announced that it will launch Ovi Store and that its music services have been launched in Australia and Singapore. Still no sense of urgency communicated. All of a sudden, it is stated that the industry is undergoing some major change, something that has not been communicated at all previously (at least not on the slides). In this presentation, even more attention is given to software and Ovi Store. For the first time, Nokia now also stated that it will try to “adjust our services businesses and open up for greater opportunities for third party partner services”. Thus, about two years after the launch of the IPhone and the shift towards an open model with application developers, the company finally announces that it is going to do something at all. In a digital world, two years is a very long time. As businesses, they still remained unintegrated mainly since Nokia still refused to do anything about its underperforming operating system. “Nokia continued to show solid smartphone momentum in lower price points”. 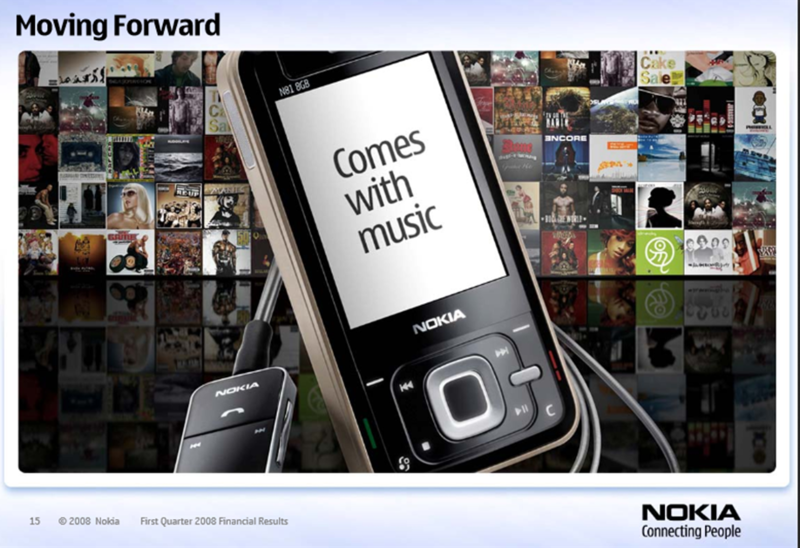 In Q2 2010, Nokia is for the first time communicating that it is doing something about its old software. Words such as “increased speed” and “innovation” are used below, but the fact of the matter is that the company is still doing more of the same, they’re still trying to compete with cars by developing a faster horse. 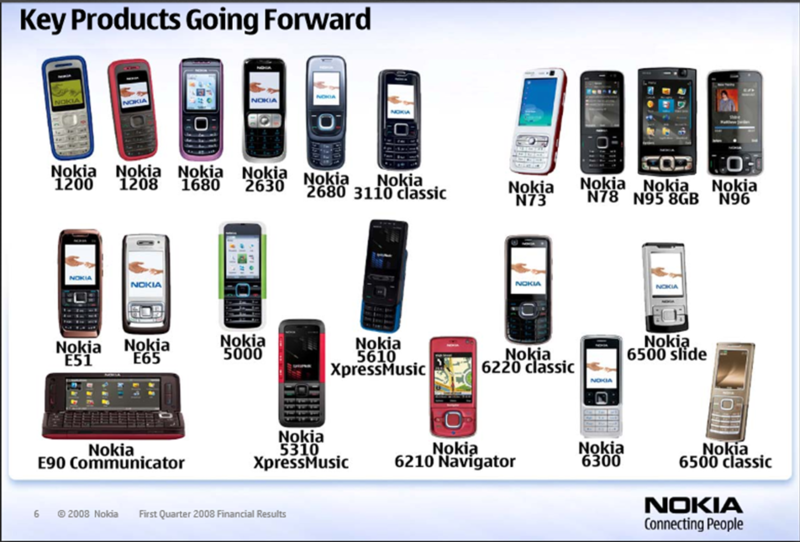 By Q3 2010, the big slides featuring Nokia’s huge (and obsolete) product portfolio are gone. 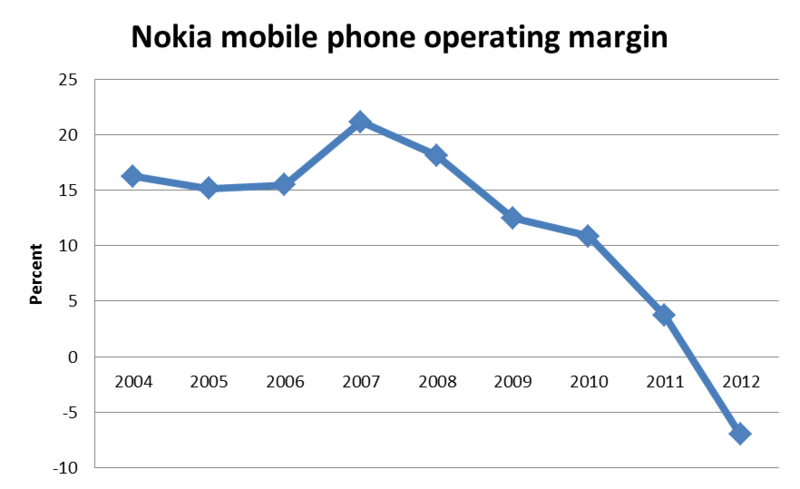 Sales declined 20 percent in Q2 2011 and went down 25 percent in Q3 the same year. In late 2010 and 2011, the presentations become so meager and dry that it hardly made sense to look at them. Having researched similar cases in other industries and given speeches about how established firms respond to technological change, I usually argue that these firms often recognize the threat but that their responses are not the right ones. Firms do after all not act in isolation, they attend fairs where new products are exhibited and usually pay attention to what competitors are doing. I therefore frequently and rather easily make a point in busting the “oversleeping myth”. 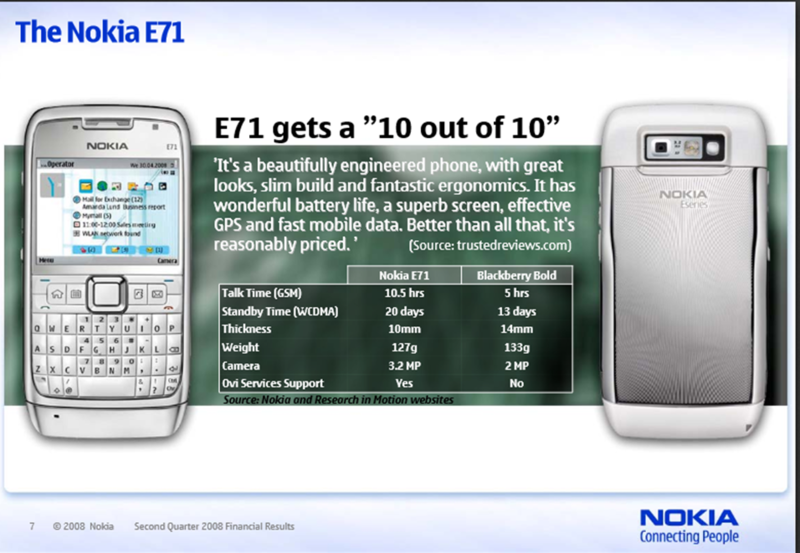 Having reviewed the material above, one hardly gets the impression that this was the case with Nokia. The company clearly overslept and top management did not realize the urgency of the situation – the slides do not communicate any major issues until suddenly it is stated in Q2 2009 that the mobile industry is undergoing rapid technological change. 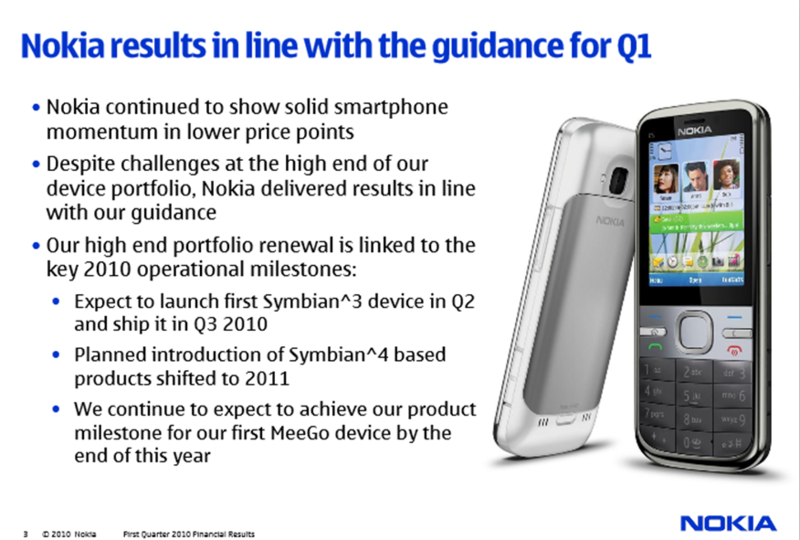 This statement was made two quarters after the legendary quote “Nokia’s longer term strategy remains valid and intact”. And once the problems were recognized, the response was for many years the faster horse strategy – better feature phones and eventually an upgrade of Symbian, an operating system that was never designed to be used on smartphones. One can only marvel at the amount of people who have lost their jobs and how much shareholder value has been destroyed by the complacency of Nokia’s top management in these years. 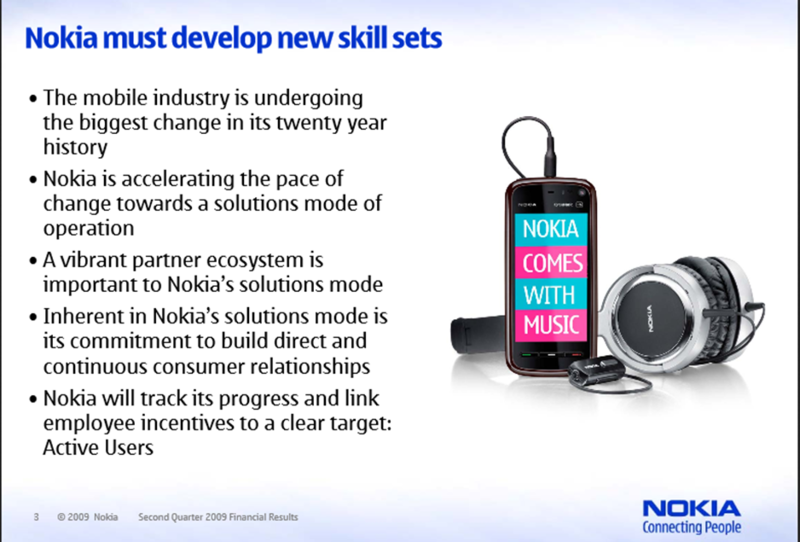 All the above material can be found at Nokia’s Investor Relations website (here).